Russia urges the UNSC to adopt a draft statement in support of the resolution on the humanitarian pause in Syria, Russian Ambassador to the United Nations Vasily Nebenzya said on Saturday. "We have circulated a draft statement on the implementation of this resolution, and we've put it prior to one o'clock, and we call upon the [Security] Council to adopt it. We hope that by 1:00 p.m. there will be no objections," Russian Ambassador to the UN Vasily Nebenzya said at the UN Security Council meeting on Syria. The Russian Permanent Representative read out a draft statement to the members of the Council, "The Security Council, in its resolution 2401, urges all parties to implement it and, for this purpose, further urges all armed groups and all Member States that have influence on them to ensure the security of humanitarian corridors for evacuation from Eastern Ghouta." "The Security Council calls for the establishing similar humanitarian corridors in At Tanf and Rubkan. The Security Council requests the Secretary-General to expeditiously send the mission to Raqqa to assess humanitarian needs there," the envoy stated. Vasily Nebenzya condemned Western countries for trying to try on the role of "champions in the field of philanthropy" and reading "lectures on humanism" of Russia in connection with the situation in the Syrian region of East Ghouta. 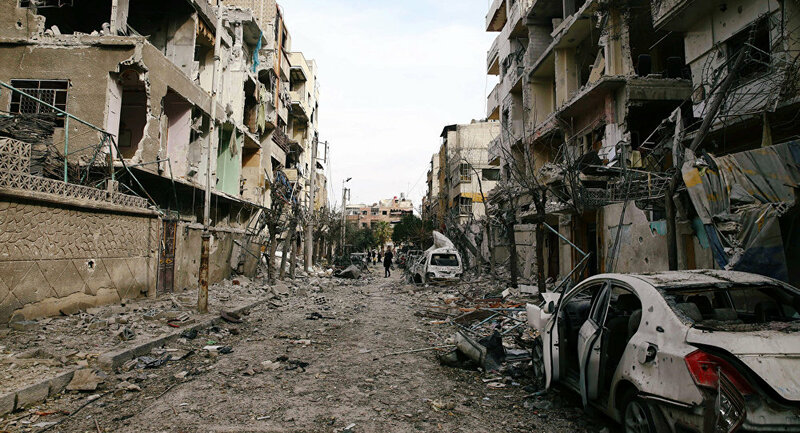 The official reminded UN countries that the coalition wiped Raqqa off the face of the earth. "Gentlemen are humanists, I will ask you once again where have you been when American aviation was wiping Raqqa off the face of the Earth? Where were your lamentations and the raising of your hands?" Nebenzya pointed out. Russia calls on the US-led coalition to admit UN officials to the Syrian city of Raqqa and to transfer control of the areas to the responsibility of the country's central authorities. "We insist that the UN promptly send an assessment mission to Raqqa, and the coalition, de facto controlling the region, should provide all the necessary conditions for it. We also expect that the coalition command, instead of creating quasi-administrations in the areas that are liberated from the Daesh (banned in Russia), will draw up a plan for their transfer to the responsibility of the central authorities, taking into account the sovereignty and territorial integrity of Syria, which has been repeatedly confirmed and re-confirmed by the Security Council" the diplomat said. The UN must not be involved in monitoring exercises in Syria following the recent resolution calling on implementing a ceasefire across the country, UN Under-Secretary-General for Political Affairs Jeffrey Feltman said during a Security Council meeting. "The UN also cautions against drawing the UN into monitoring exercises. This has been tried in the past, not for a lack of trying, but in the absence of political will among member states to underpin UN efforts," Feltman said. The UN Security Council held a meeting on the humanitarian situation in Syria. The meeting focused on the situation on the Damascus suburb East Ghouta, but the participants in the discussion mentioned other areas of Syria, including Raqqa, liberated from Daesh in October 2017 with the support of the US and its allies. Speaking at a meeting, UN Deputy Secretary-General for Humanitarian Affairs Mark Lowcock outlined a grim picture of what is happening in Raqqa, noting that civilians cannot safely return to the city. According to him, humanitarian workers also do not have access to Raqqa, which urgently needs to conduct a mine clearance operation. According to the statement by the Russian Reconciliation Center, about 300 civilians were trapped in Eastern Ghouta on February 26, unable to leave due to the shelling in spite of the "humanitarian pause." Militants have continued attacking the Syrian army, who, jointly with the Russian Center for Syrian Reconciliation, has prepared the humanitarian corridor for the exit of civilians from Eastern Ghouta.